Montana is unique among other Western states and most states in general. In 1984, the Montana Supreme Court ruled that the public may use rivers or streams with recreation capability, for activities such as fishing and floating, regardless of whether the river is navigable or who the streambed property owner is. This ruling allowed anglers and floaters to have full use of most rivers in Montana for fishing, floating, swimming and other river related activities. This ruling became what is now called the Montana Stream Access Law. “Ordinary high-water mark” means the line that water impresses on land by covering it for sufficient periods to cause physical characteristics that distinguish the area below the line from the area above it. Characteristics of the area below the line include, when appropriate, but are not limited to deprivation of the soil of substantially all terrestrial vegetation and destruction of its agricultural vegetative value. A flood plain adjacent to surface waters is not considered to lie within the surface waters’ high-water marks. “Recreational use” means with respect to surface waters: fishing, hunting, swimming, floating in small craft or other flotation devices, boating in motorized craft unless otherwise prohibited or regulated by law, or craft propelled by oar or paddle, other water-related pleasure activities, and related unavoidable or incidental uses. In other words, anglers can fish and float with non-motorized craft, provided they follow the restrictions listed in the latest fishing regulations. Motorized watercraft have further restrictions on their use (these restrictions are there to prevent conflicts between motorized boats and floaters/wade anglers/float anglers). Since the Montana stream access law applies to most rivers and streams that flow through private property, many rivers have various man-made and natural obstructions. A floater or angler who encounters these obstructions may climb above the high water mark, if necessary, to avoid these obstructions in the least intrusive way possible (some landowners don’t like it, but it says – explicitly – that you can do this in the statute.). Thus, Montana has a very liberal stream access that allows the public to have full use of most rivers and streams in Montana for recreational purposes. However, it is important to realize that this law does not give the public right to cross private property to reach the rivers. The landowner has not specifically told the person to stay out. If all three conditions are met, a person may cross land that is private property to reach a river to fish or float. Not surprisingly, most private property in Montana is marked with lots of orange paint and “No Trespassing” signs. This limits the public’s ability to cross private property without permission. Where the river does not pass through federal/state lands (such as National Forest, BLM and State Forest property). Finally, all the orange paint and “no trespassing” signs do not mean angler’s can’t cross land to reach a river to float or fish. Instead, to gain access to property that is posted, all that is usually required is a polite request to the landowner. 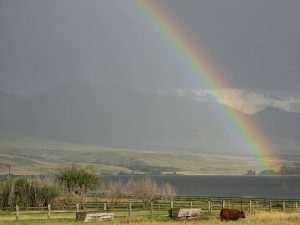 In most areas of Montana (there are some exceptions, mainly in the Ruby River area, which is home to most of the states “pay to fish” areas), many landowners allow access to private property for fishing and floating purposes. Final note : As of 2018, this law is still in effect, despite the multiple challenges the law has faced over the years.